If you already own a tenkara rod and a spool of tippet, the Simple Fly Fishing Kit includes everything else you need to make a more direct connection to the fly fishing experience. At the heart of the kit is Simple Fly Fishing: Techniques for Tenkara and Rod & Reel. Published by Patagonia, Simple Fly Fishing is the most comprehensive book available on the subject of simple fly fishing and specifically the tenkara technique. Written by Yvon Chouinard, Craig Mathews and Mauro Mazzo, with paintings by James Prosek, the book covers wet fly, nymph and dry fly fishing. 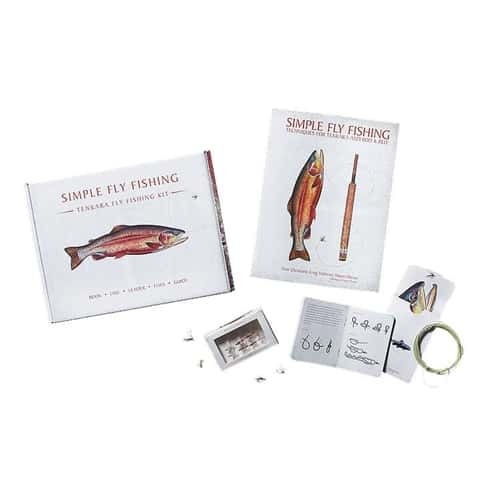 Simple Fly Fishing clears the fog of complexity that often surrounds the sport and delivers simple explanation and easy-to-understand instruction. Readers new to the sport can be fishing effectively within an hour; expert fly fishers will learn why these techniques work in highly technical situations when nothing else will. Also included in the kit is our tenkara line (designed by Cortland specifically for our rods) with rigging instructions; a 7.5’ 3x tapered leader; a box of one-dozen soft-hackle flies hand tied by the Montana Fly Company, covering the range of hatches most commonly encountered (three of each pattern: Mormon Girl, Pheasant Tail, Peacock, and Hare’s Ear) and a quick set up guide that gets you rigged up and fishing in minutes. Made in China and Thailand.